This is an easy and quick to fix dish that is good as a snack or with a meal or just before a meal. I especially like to fix it when I’ve been out in the garden longer than anticipated, am so hungry, and dinner won’t be ready for two hours. Enjoy it in the summer with everything freshfrom the garden for the ultimate in taste. Fresh dill is your secret ingredient. 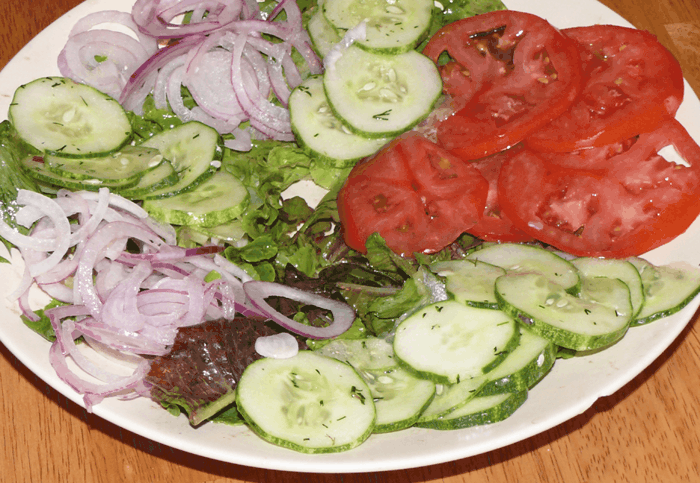 Slicing your onion and cucumber very thin is your other secret. 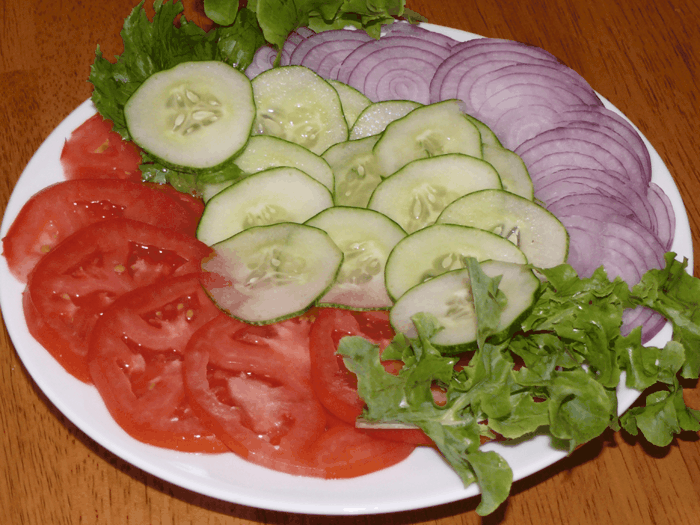 Slice up a cucumber and a red onion. (My red onions are so sweet and mild.) Chop enough fresh dill to make at least 2 or 3 teaspoons full. 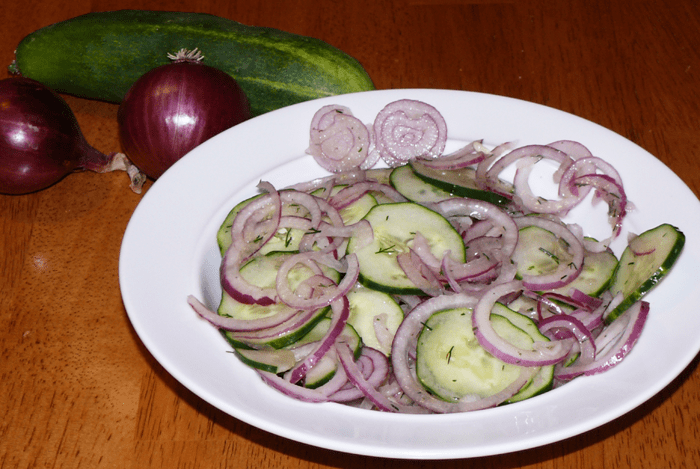 Place sliced cucumber and onion in a good sized bowl. Drizzle olive oil on and then drizzle white wine vinegar. Sprinkle chopped dill on top and salt and pepper to taste. Toss and serve. If your diet allows sour cream, it’s really wonderful with this. If you want something a bit more substantial and are a big tomato fan ——go ahead and enjoy! Shown below with the oil, vinegar and dill dressing. Make this your main meal by adding a baked potato straight from the garden. Nothing could be better! Enjoy! I love love love recipes. Thank you so much, and with beautiful pictures as well. Can you tell me what red onion variety you like to eat? This just makes me so hungry for summer. Tony, I can’t find my notes on the red onion that I really enjoyed eating. It is no longer available anyway, which is why I’m not growing it. When you buy seed or transplants for red onions, look for the word “sweet” or look for ones that don’t store as long. They’ll be the sweeter ones.